One part of the festive season which has become a tradition in its own right is the frenzied race for the Christmas number one single. Some well-known names bring us seasonal nuggets which capture both the party mood and more reflective, sombre side of the season of goodwill. Novelty records and relative unknowns also come into their own at Christmas. This year is no exception, with a varied bunch of songs vying for that coveted place in the chart archives. The all-conquering Irish boy band aim for their 14th chart-topper - and second Christmas number one - with the help of Motown legend Diana Ross, who had a hit with this song back in 1991. This is an emotional power ballad, lacking in any obvious snow-topped festive spirit. But given the enduring pulling power of Westlife and Ross, this is tipped by the bookies to go all the way. The TV talent show juggernaut has come to an end just in time to make an assault on the Christmas number one spot. Mancunian Shayne Ward was crowned the winner, and his debut single - That's My Goal - is set to hit the shops on 21 December, and is tipped to go straight in at number one on Christmas Day. Former contestant Chico Slimani is also being singled out for festive chart success in his own right, but his X Factor contract means he must wait until the winner's song has hit the shops to release his own effort. This unheralded duo from Warwickshire, Luke Concannon and John Parker, could spring a surprise and take their tune all the way to the number one spot. It's a touching tale about a boy enjoying a ride in a JCB with his father and wishing he could use the mighty machine to tackle bullies at his school. It may not be festooned with jingle bells and have a seasonal message, but this could provide an unexpected chart-topper, which last happened in 2003 with Gary Jules' cover of Mad World. The cartoon amphibian known for irritating most of the population with his 'ding ding dididing' chirruping makes a strong challenge in the novelty record stakes with this seasonal offering. Crazy Frog spent four weeks at number one earlier this year with Axel F, while follow-up Popcorn stalled at 12. 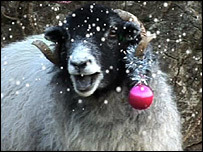 But the frog faces a battle with the Baarmy Sheep, whose version of Jingle Bells was conceived by the Cumbrian Tourist Board to attract visitors to the Lake District. Success for either of these acts would mark a return to the Christmas winners of Bob The Builder (1996) and Mr Blobby (1993). The sporting superstars of the summer have teamed up with singer Keedie for a stirring version of the famous anthem. Keedie does most of the hard work on this, while some of the proceeds are going towards the Asian earthquake appeal fund. The England team recorded their contribution to the track in a makeshift studio whilst on tour in Pakistan. A trio of young singers are also in the race for the Christmas number one with their version of Eric Clapton's Tears In Heaven, the proceeds of which will be going to the NSPCC. But with operatic harmony groups G4 and Il Divo also making a play for the Christmas singles chart, this part of the market could prove a little too congested. G4 - runners-up on the first series of The X Factor - are covering When A Child Is Born, which was a Christmas number one for Johnny Mathis in 1976. This year's Christmas number one will be announced on BBC Radio 1's chart show on Christmas Day from 1600-1900 GMT. Who deserves to become Christmas number one?